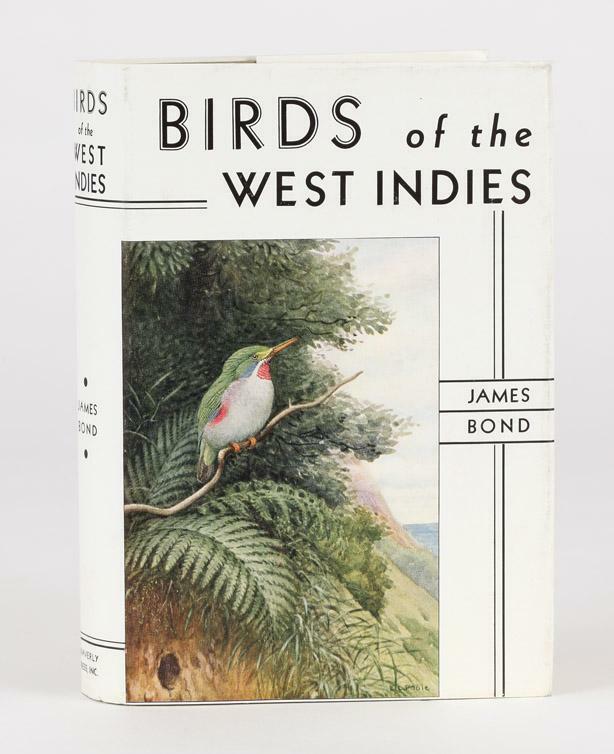 Ever since the first time I ever heard about how Ian Fleming choose the name for his secret agent James Bond, I have always wanted to have the FIELD GUIDE OF BIRDS OF THE WEST INDIES in my collection. I have been hunting this book for over 20 years, and now I have it. Okey I have had a reprint of the book printed in 1971 in my collection for some time but it is now for sale. The reason that I was not satisfied with that version of the book is because when Ian Fleming built his Jamaica home after the second world war he had a copy of the FIELD GUIDE OF BIRDS OF THE WEST INDIES in his home written by James Bond. A book he often used while looking at birds. The book was first released in 1936 with a stunning dust jacket and the second printing came out in 1947 and that is the one I have now and most surely the edition of the book that Fleming had as well. On the below YouTube clip you can see Fleming explain how he came to use the name but on that footage there is a 1960's copy of the book. 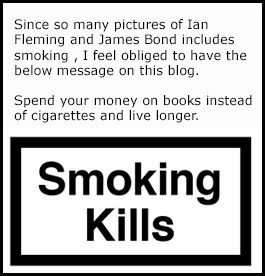 Since Casino Royale was released in 1953 Ian Fleming must have had the 1947 edition at his home. So this is not the actual book Fleming had but a really rare piece of James Bond memorabilia to have in the collection and I am very happy to have gotten it from a auction house in the UK for £230. 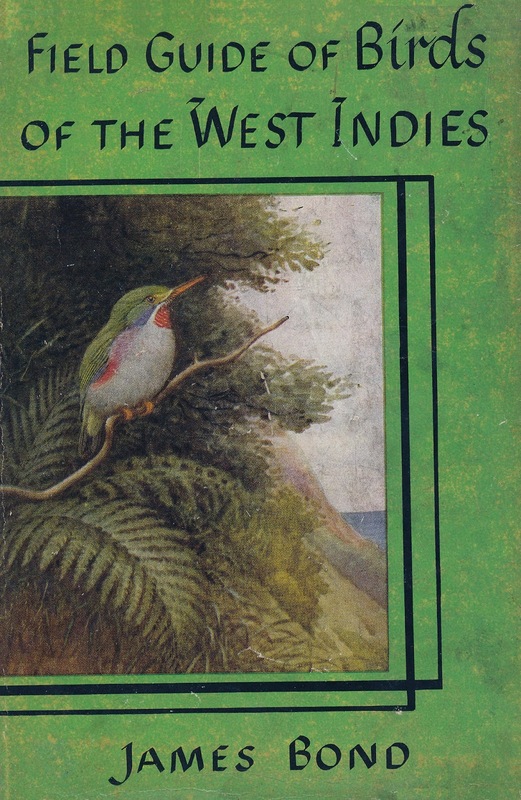 Note that many people wrongly says that this book was called BIRDS OF WEST INDIES but the actual title was FIELD GUIDE OF BIRDS OF THE WEST INDIES. 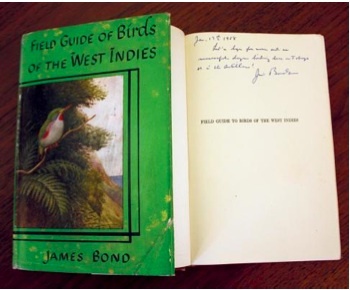 In 1964, Fleming gave Bond a first edition copy of You Only Live Twice signed, "To the real James Bond, from the thief of his identity". In December 2008 the book was put up for auction, eventually fetching $84,000. 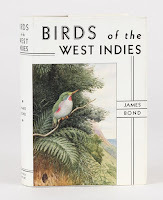 In the 2002 Bond film Die Another Day, the fictional Bond, played by Pierce Brosnan, can be seen examining Birds of the West Indies in an early scene that takes place in Havana, Cuba. The author's name (James Bond) on the front cover is obscured. In the same film, when Bond first meets Jinx (Halle Berry), he introduces himself as an ornithologist. Anyone else out there who have this book in the collection?